Explain the difference perspectives of a geocentric and heliocentric universe mindset. Describe the basic function of the solar system and how it likely formed. Compare the similarities and differences of the terrestrial planets. Compare the similarities and differences between the jovian planets. Describe the various other objects within the solar system. Humans' view of the solar system has evolved as technology and scientific knowledge have increased. The ancient Greeks identified five of the planets and for many centuries they were the only planets known. Since then, scientists have discovered two more planets, many other solar-system objects and even planets found outside our solar system. The ancient Greeks believed that Earth was at the center of the universe. This view is called the geocentric model of the universe. Geocentric means "Earth-centered." In the geocentric model, the sky, or heavens, are a set of spheres layered on top of one another. Each object in the sky is attached to a sphere and moves around Earth as that sphere rotates. From Earth outward, these spheres contain the Moon, Mercury, Venus, the Sun, Mars, Jupiter, and Saturn. An outer sphere holds all the stars. Since the planets appear to move much faster than the stars, the Greeks placed them closer to Earth. The geocentric model worked well by explaining why all the stars appear to rotate around Earth once per day. The model also explained why the planets move differently from the stars and from each other. One problem with the geocentric model is that some planets seem to move backwards (in retrograde) instead of in their usual forward motion around Earth. Around 150 A.D. the astronomer Ptolemy resolved this problem by using a system of circles to describe the motion of planets. In Ptolemy’s system, a planet moves in a small circle, called an epicycle. This circle moves around Earth in a larger circle, called a deferent. Ptolemy’s version of the geocentric model worked so well that it remained the accepted model of the universe for more than a thousand years. Ptolemy’s geocentric model worked but it was not only complicated, it occasionally made errors in predicting the movement of planets. At the beginning of the 16th century A.D., Nicolaus Copernicus proposed that Earth and all the other planets orbit the Sun. With the Sun at the center, this model is called the heliocentric model or "sun-centered" model of the universe. Copernicus’ model explained the motion of the planets as well as Ptolemy’s model did, but it did not require complicated additions like epicycles and deferents. Although Copernicus’ model worked more simply than Ptolemy’s, it still did not perfectly describe the motion of the planets because, like Ptolemy, Copernicus thought planets moved in perfect circles. Not long after Copernicus, Johannes Kepler refined the heliocentric model so that the planets moved around the Sun in ellipses (ovals), not circles. Kepler’s model matched observations perfectly. Because people were so used to thinking of Earth at the center of the universe, the heliocentric model was not widely accepted at first. However, when Galileo Galilei first turned a telescope to the heavens in 1610, he made several striking discoveries. Galileo discovered that the planet Jupiter has moons orbiting around it. This provided the first evidence that objects could orbit something besides Earth. Galileo also discovered that Venus has phases like the Moon, which provides direct evidence that Venus orbits the Sun. Galileo’s discoveries caused many more people to accept the heliocentric model of the universe, although Galileo himself was found guilty of heresy for his ideas. The shift from an Earth-centered view to a Sun-centered view of the universe is referred to as the Copernican Revolution. Watch this animation of the Ptolemaic and Copernican models of the solar system. Ptolemy made the best model he could with the assumption that Earth was the center of the universe, but by letting that assumption go, Copernicus came up with a much simpler model. Before people would accept that Copernicus was right, they needed to accept that the Sun was the center of the solar system. Today we know that just as Earth orbits the Sun, the Sun and solar system orbit the center of the Milky Way galaxy. That center is likely to be a massive black hole. One orbit of the solar system takes about 225 to 250 million years. The solar system has orbited 20 to 25 times since it formed 4.6 billion years ago. Today, we know that our solar system is just one tiny part of the universe as a whole. Neither Earth nor the Sun are at the center of the universe. However, the heliocentric model accurately describes the solar system. In our modern view of the solar system, the Sun is at the center, with the planets moving in elliptical orbits around the Sun. The planets do not emit their own light, but instead reflect light from the Sun. Since the early 1990s, astronomers have discovered other solar systems, with planets orbiting stars other than our own Sun, called extrasolar planets or simply exoplanets. Some extrasolar planets have been directly observed, but most have been discovered by indirect methods. One technique involves detecting the very slight motion of a star periodically moving toward and away from us along our line-of-sight, known as a star’s radial velocity. This periodic motion can be attributed to the gravitational pull of a planet or, sometimes, another star orbiting the star. A planet may also be identified by measuring a star’s brightness over time. A temporary, periodic decrease in light emitted from a star can occur when a planet crosses in front of the star it is orbiting, called a transit, momentarily blocking out some of the starlight. So far, more than 3,600 extrasolar planets have been identified and the rate of discovery is increasing rapidly. Since the time of Copernicus, Kepler, and Galileo, we have learned a lot more about our solar system. Astronomers have discovered two more planets (Uranus and Neptune), four dwarf planets (Ceres, Pluto, Makemake, Haumea, and Eris), more than 150 moons, and many, many asteroids and other small objects. Although the Sun is just an average star compared to other stars, it is by far the largest object in the solar system. The Sun is more than 500 times the mass of everything else in the solar system combined. The table below gives data on the sizes of the Sun and planets relative to Earth. The figure below shows the relative sizes of the orbits of the major planets within our solar system. In general, the farther away from the Sun, the greater the distance from one planet’s orbit to the next. The orbits of the planets are not circular but slightly elliptical with the Sun located at one of the foci. While studying the solar system, Johannes Kepler discovered the relationship between the time it takes a planet to make one complete orbit around the Sun, its "orbital period," and the distance from the Sun to the planet. If the orbital period of a planet is known, then it is possible to determine the planet’s distance from the Sun. This is how astronomers without modern telescopes could determine the distances to other planets within the solar system. Distances in the solar system are often measured in astronomical units (AU). One astronomical unit is defined as the distance from Earth to the Sun. 1 AU equals about 150 million km, or 93 million miles. Table below shows the distances to the planets (the average radius of orbits) in AU. The table also shows how long it takes each planet to spin on its axis (the length of a day) and how long it takes each planet to complete an orbit (the length of a year); in particular, notice how slowly Venus rotates relative to Earth. Isaac Newton was one of the first scientists to explore gravity. He understood that the Moon circles the Earth because a force is pulling the Moon toward Earth’s center. Without that force, the Moon would continue moving in a straight line off into space. Newton also came to understand that the same force that keeps the Moon in its orbit is the same force that causes objects on Earth to fall to the ground. Newton defined the Universal Law of Gravitation, which states that a force of attraction, called gravity, exists between all objects in the universe. The strength of the gravitational force depends on how much mass the objects have and how far apart they are from each other. The greater the objects’ mass, the greater the force of attraction; in addition, the greater the distance between the objects, the smaller the force of attraction. The distance between the Sun and each of its planets is very large, but the Sun and each of the planets are also very large. Gravity keeps each planet orbiting the Sun because the star and its planets are very large objects. The force of gravity also holds moons in orbit around planets. There are two additional key features of the solar system that help us understand how it formed: 1) All the planets lie in nearly the same plane, or flat disk like region, 2) All the planets orbit in the same direction around the Sun. The most widely accepted explanation of how the solar system formed is called the nebular hypothesis. According to this hypothesis, the Sun and the planets of our solar system formed about 4.6 billion years ago from the collapse of a giant cloud of gas and dust, called a nebula. The nebula was drawn together by gravity, which released gravitational potential energy. As small particles of dust and gas smashed together to create larger ones, they released kinetic energy. As the nebula collapsed, the gravity at the center increased and the cloud started to spin because of its angular momentum. As it collapsed further, the spinning got faster, much as an ice skater spins faster when he pulls his arms to his sides during a spin. Much of the cloud’s mass migrated to its center but the rest of the material flattened out in an enormous disk. The disk contained hydrogen and helium, along with heavier elements and even simple organic molecules. As gravity pulled matter into the center of the disk, the density and pressure at the center became intense. When the pressure in the center of the disk was high enough, nuclear fusion within our star began and the burning star stopped the disk from collapsing further. Meanwhile, the outer parts of the disk were cooling off. Matter condensed from the cloud and small pieces of dust started clumping together. These clumps collided and combined with other clumps. Larger clumps, called planetesimals, attracted smaller clumps with their gravity. Gravity at the center of the disk attracted heavier particles, such as rock and metal and lighter particles remained further out in the disk. Eventually, the planetesimals formed ﻿protoplanets﻿, which grew to become the planets and moons that we find in our solar system today. Because of the gravitational sorting of material with the inner planets, Mercury, Venus, Earth, and Mars, dense rock and metal formed. The outer planets, Jupiter, Saturn, Uranus and Neptune, condensed farther from the Sun from lighter materials such as hydrogen, helium, water, ammonia, and methane. Out by Jupiter and beyond, where it’s very cold, these materials formed solid particles. The two videos below, from the the European Space Agency (ESA), discusses the Sun, planets, and other bodies in the Solar System and how they formed. The first part of the video explores the evolution of our view of the solar system starting with the early Greeks who reasoned that since some points of light, which they called planets, moved faster than the stars, they must be closer. What evidence do planetary geologists have to go on to determine the geology of the inner planets? On Earth, scientists can collect and analyze the chemistry of samples, do radiometric dating to determine their ages, and look at satellite images to see large-scale features. Rovers have landed on Mars and sent back enormous amounts of information but much of the rest of what is known about the inner planets is from satellite images. The inner planets, or terrestrial planets, are the four planets closest to the Sun: Mercury, Venus, Earth, and Mars. Figure below shows the relative sizes of these four inner planets. Unlike the outer planets, which have many of satellites, Mercury and Venus do not have moons, Earth has one, and Mars has two. Of course, the inner planets have shorter orbits around the Sun, and they all spin more slowly. Geologically, the inner planets are all made of cooled igneous rock with iron cores, and all have been geologically active, at least early in their history. None of the inner planets has rings. The smallest planet, Mercury, is the planet closest to the Sun. Because Mercury is so close to the Sun, it is difficult to observe from Earth, even with a telescope. However, the Mariner 10 spacecraft visited Mercury from 1974 to 1975. The MESSENGER spacecraft, which stands for Mercury Surface, Space Environment, Geochemistry, and Ranging, has been studying Mercury in detail since 2005. The craft is currently in orbit around the planet, where it is creating detailed maps. MESSENGER stands for Mercury Surface, Space Environment, Geochemistry and Ranging. As the figure on the left shows, the surface of Mercury is covered with craters. Ancient impact craters means that for billions of years Mercury hasn’t changed much geologically. Also, with very little atmosphere, the processes of weathering and erosion do not wear down structures on the planet. Mercury is one of the solar system's densest planets. It’s relatively large, liquid core, made mostly of melted iron, takes up about 42% of the planet's volume. Mercury is named for the Roman messenger god, who could run extremely quickly, just as the planet moves very quickly in its orbit around the Sun. A year on Mercury, the length of time it takes to orbit the Sun, is just 88 Earth days. Despite its very short years, Mercury has very long days. A day is defined as the time it takes a planet to turn on its axis. Mercury rotates slowly on its axis, turning exactly three times for every two times it orbits the Sun. Therefore, each day on Mercury is 57 Earth days long. In other words, on Mercury, a year is only a Mercury day and a half long! Mercury is close to the Sun, so it can get very hot. However, Mercury has virtually no atmosphere, no water to insulate the surface, and it rotates very slowly. For these reasons, temperatures on the surface of Mercury vary widely. In direct sunlight, the surface can be as hot as 427°C (801°F). On the dark side, or in the shadows inside craters, the surface can be as cold as -183°C (-297°F)! Although most of Mercury is extremely dry, scientists think there may be a small amount of water in the form of ice at the poles of Mercury, in areas that never receive direct sunlight. Named after the Roman goddess of love, Venus is the only planet named after a female. Venus’ thick clouds reflect sunlight well so Venus is very bright making it the brightest object in the sky besides the Sun and the Moon. Because the orbit of Venus is inside Earth’s orbit, Venus always appears close to the Sun. When Venus rises just before the Sun rises, the bright object is called the morning star. When it sets just after the Sun sets, it is the evening star. Of the planets, Venus is most similar to Earth in size and density. Venus is also our nearest neighbor. The planet’s interior structure is similar to Earth’s with a large iron core and a silicate mantle. But the resemblance between the two inner planets ends there. Venus rotates in a direction opposite the other planets and opposite to the direction it orbits the Sun. This rotation is extremely slow, only one turn every 243 days. This is longer than a year on Venus where it only takes Venus 224 days to orbit the Sun. Venus is covered by a thick layer of clouds. Venus' clouds are not made of water vapor like Earth’s clouds. Clouds on Venus are made mostly of carbon dioxide with a bit of sulfur dioxide and corrosive sulfuric acid. Because carbon dioxide is a greenhouse gas, the atmosphere traps heat from the Sun and creates a powerful greenhouse effect. Even though Venus is further from the Sun than Mercury, the greenhouse effect makes Venus the hottest planet. Temperatures at the surface reach 465°C (860°F). That’s hot enough to melt lead. A topographic view of Venus using radar. The atmosphere of Venus is so thick that the atmospheric pressure on the planet’s surface is 90 times greater than the atmospheric pressure on Earth’s surface. The dense atmosphere totally obscures the surface of Venus, even from spacecraft orbiting the planet. Since spacecraft cannot see through the thick atmosphere, radar is used to map Venus’ surface. Many features found on the surface are similar to Earth and yet are very different. The figure on the left shows a topographical map of Venus produced by the Magellan probe using radar. Orbiting spacecraft have used radar to reveal mountains, valleys, and canyons. Most of the surface has large areas of volcanoes surrounded by plains of lava. In fact, Venus has many more volcanoes than any other planet in the solar system and some of those volcanoes are very large. Most of the volcanoes are no longer active, but scientists have found evidence that there is some active volcanism. Think about what you know about the geology of Earth and what produces volcanoes. What does the presence of volcanoes suggest about the geology of Venus? What evidence would you look for to find the causes of volcanism on Venus? Venus also has very few impact craters compared with Mercury and the Moon. What is the significance of this? Earth has fewer impact craters than Mercury and the Moon too. Is this for the same reason that Venus has fewer impact craters? It’s difficult for scientists to figure out the geological history of Venus. The environment is too harsh for a rover to go there. It is even more difficult for students to figure out the geological history of a distant planet based on the information given here. Still we can piece together a few things. On Earth, volcanism is generated because the planet’s interior is hot. Much of the volcanic activity is caused by plate tectonic activity. But on Venus, there is no evidence of plate boundaries and volcanic features do not line up the way they do at plate boundaries. Because the density of impact craters can be used to determine how old a planet’s surface is, the small number of impact craters means that Venus’ surface is young. Scientists think that there is frequent, planet-wide resurfacing of Venus with volcanism taking place in many locations. The cause is heat that builds up below the surface that has no escape until finally it destroys the crust and results in volcanoes. Mars is the fourth planet from the Sun, and the first planet beyond Earth’s orbit. Mars is a quite different from Earth and yet more similar than any other planet. 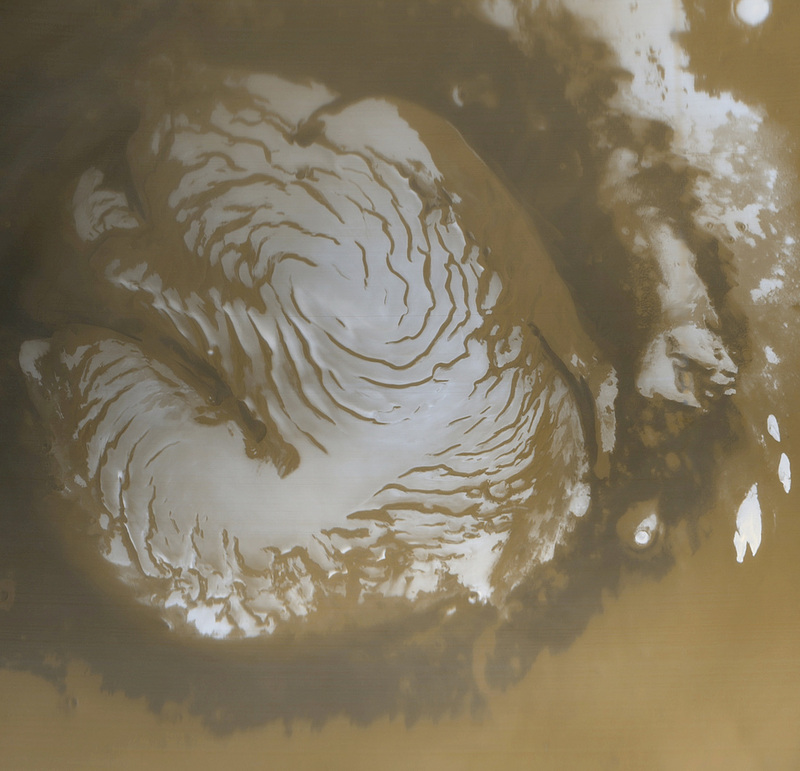 Mars is smaller, colder, drier, and appears to have no life, but volcanoes are common to both planets and Mars has many. Mars is easy to observe so the planet has been studied more thoroughly than any other extraterrestrial planet in our solar system. Space probes, rovers, and orbiting satellites have all yielded information to planetary geologists. Although no humans have ever set foot on Mars, both NASA and the European Space Agency have set goals of sending people to Mars sometime between 2030 and 2040. Viewed from Earth, Mars is reddish in color. The ancient Greeks and Romans named the planet after the god of war. But the surface is not red from blood but from large amounts of iron oxide in the soil. The Martian atmosphere is very thin relative to Earth’s and has much lower atmospheric pressure. Although the atmosphere is made up mostly of carbon dioxide, the planet has only a weak greenhouse effect so temperatures are only slightly higher than if the planet had no atmosphere. Mars has mountains, canyons, and other features similar to Earth and some of these surface features are amazing for their size. 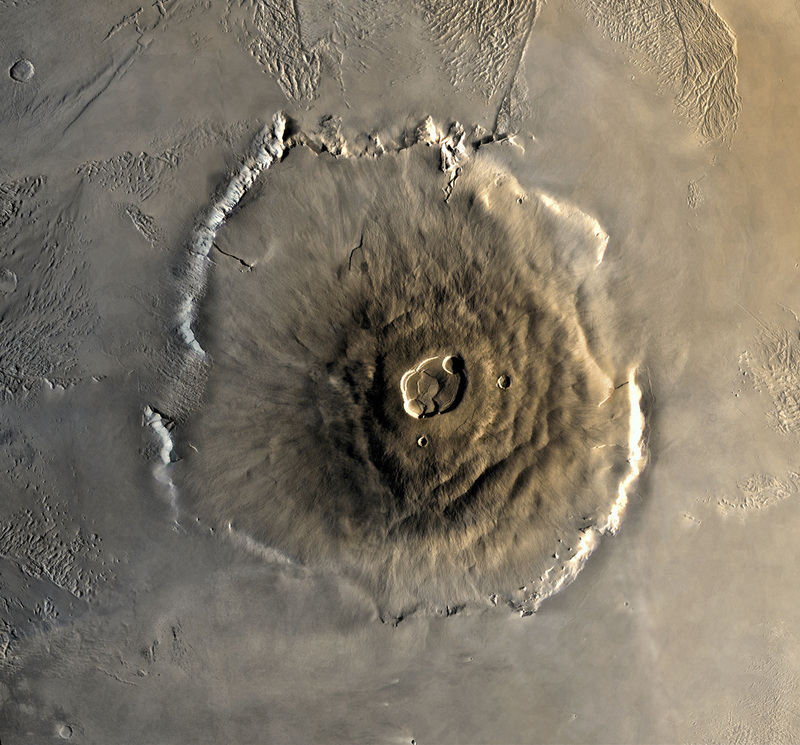 Olympus Mons is a shield volcano, similar to the volcanoes that make up the Hawaiian Islands. But Olympus Mons is also the largest mountain in the solar system. Mars also has the largest canyon in the solar system, Valles Marineris. Mars has more impact craters than Earth, though fewer than the Moon. Discovery Channel created a video comparing geologic features and tectonics on Mars and Earth. 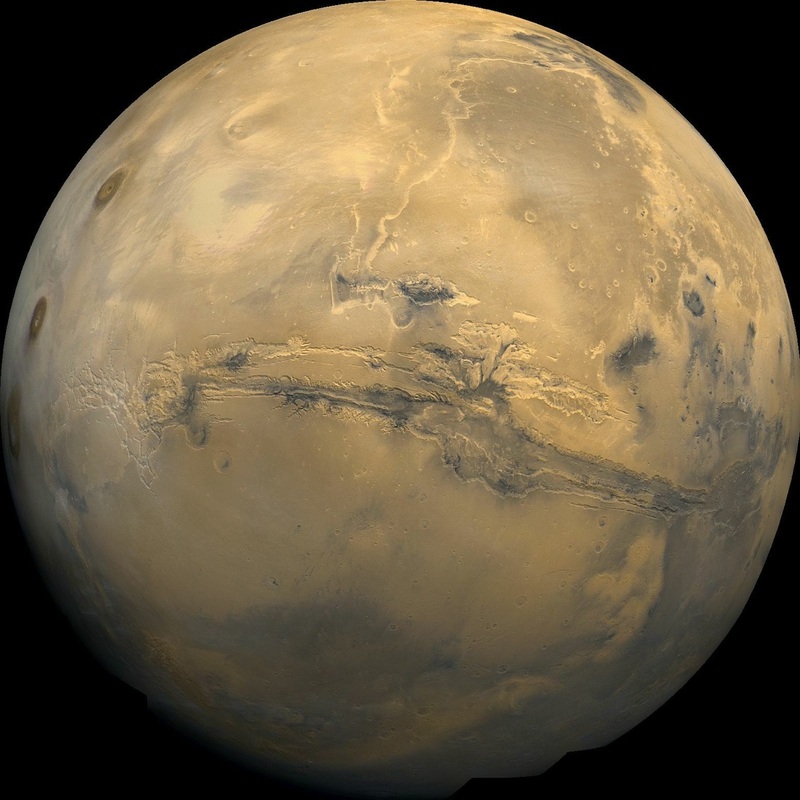 Water cannot stay in liquid form on Mars because the atmospheric pressure is too low. However, there is a lot of water in the form of ice and even prominent ice caps. Scientists also think that there is a lot of water ice present just under the Martian surface. This ice can melt when volcanoes erupt, and water can flow across the surface temporarily. Scientists think that water once flowed over the Martian surface because there are surface features that look like water-eroded canyons. 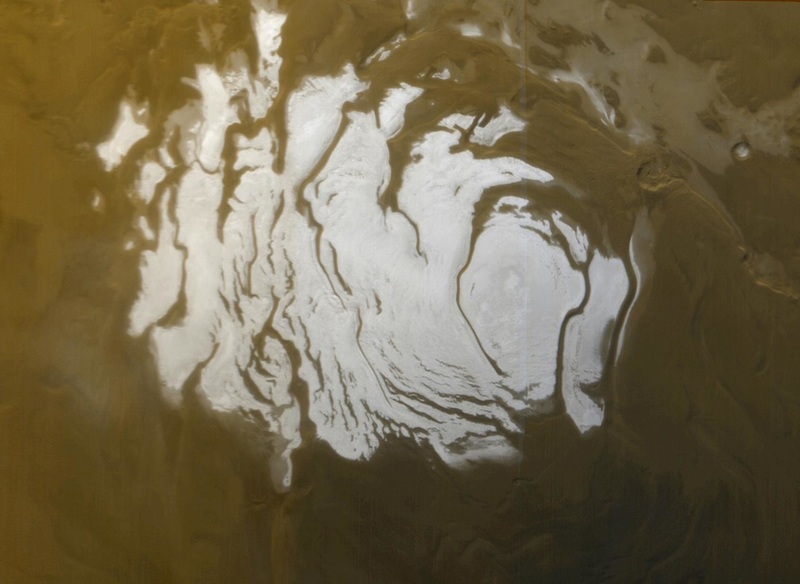 The presence of water on Mars, even though it is now frozen as ice, suggests that it might have been possible for life to exist on Mars in the past. Mars has two very small moons that are irregular rocky bodies. Phobos and Deimos are named after characters in Greek mythology; the two sons of Ares, who followed their father into war. Ares is equivalent to the Roman god Mars. Discovery Channel also created a video of the top five Phoenix Lander sites on Mars. Find out all you want to know about Mars at NASA's Mars Exploration website. Planetary comparison of Earth and Mars. The four planets farthest from the Sun are the outer planets. These planets are much larger than the inner planets and are made primarily of gases and liquids, so they are also called gas giants or Jovian planets. The gas giants are made up primarily of hydrogen and helium, the same elements that make up most of the Sun. Astronomers think that hydrogen and helium gases comprised much of the solar system when it first formed. Since the inner planets didn’t have enough mass to hold on to these light gases, their hydrogen and helium floated away into space. The Sun and the massive outer planets had enough gravity to keep hydrogen and helium from drifting away. All of the outer planets have numerous moons. They all also have planetary rings, composed of dust and other small particles that encircle the planet in a thin plane. Because Jupiter is so large, it reflects a lot of sunlight. Jupiter is extremely bright in the night sky; only the Moon and Venus are brighter. This brightness is all the more impressive because Jupiter is quite far from the Earth, 5.20 AUs away. It takes Jupiter about 12 Earth years to orbit once around the Sun. Jupiter is named for the king of the gods in Roman mythology. The planet is enormous, the largest object in the solar system besides the Sun. Although Jupiter is over 1,300 times Earth’s volume, it has only 318 times the mass of Earth. Like the other gas giants, it is less dense than Earth. Astronauts trying to land a spaceship on the surface of Jupiter would find that there is no solid surface at all. Jupiter is made mostly of hydrogen, with some helium, and small amounts of other elements. The upper layer of Jupiter’s atmosphere contains clouds of ammonia (NH3) in bands of different colors. These bands rotate around the planet, but also swirl around in turbulent storms. The Great Red Spot is an enormous, oval-shaped storm found south of Jupiter’s equator. This storm is more than three times as wide as the entire Earth. Clouds in the storm rotate in a counterclockwise direction, making one complete turn every six days or so. The Great Red Spot has been on Jupiter for at least 300 years, since astronomers could first see the storm through telescopes. Do you think the Great Red Spot is a permanent feature on Jupiter? How could you know? Jupiter has 63 moons orbiting it that we are aware of so far. Four are big enough and bright enough to be seen from Earth, using no more than a pair of binoculars. These four moons, Io, Europa, Ganymede, and Callisto, were first discovered by Galileo in 1610 and are referred to as the Galilean moons. The Galilean moons are larger than the dwarf planets Pluto, Ceres, and Eris. Ganymede is not only the biggest moon in the solar system it is even larger than the planet Mercury. Scientists are particularly interested in Europa because it may be a place to find extraterrestrial life. Although the surface of Europa is a smooth layer of ice, there is evidence that there is an ocean of liquid water underneath. Europa also has a continual source of energy; it is heated as it is stretched and squashed by tidal forces from Jupiter. Numerous missions have been planned to explore Europa, including plans to drill through the ice and send a probe into the ocean. However, no such mission has yet been attempted. In 1979, two spacecrafts, Voyager 1 and Voyager 2, visited Jupiter and its moons. Photos from the Voyager missions showed that Jupiter has a faint ring system. This ring system is very faint, so it is difficult to observe from Earth. Saturn is famous for its beautiful rings. Although all the gas giants have rings, only Saturn’s can be easily seen from Earth. In Roman mythology, Saturn was the father of Jupiter. Saturn’s mass is about 95 times the mass of Earth, and its volume is 755 times Earth’s volume, making it the second largest planet in the solar system. Saturn is also the least dense planet in the solar system. It is less dense than water meaning that Saturn would float on water. Saturn orbits the Sun once about every 30 Earth years. Like Jupiter, Saturn is made mostly of hydrogen and helium gases in the outer layers and liquids at greater depths. The upper atmosphere has clouds in bands of different colors. These rotate rapidly around the planet, but there seems to be less turbulence and fewer storms on Saturn than on Jupiter. One interesting phenomena that has been observed in the storms on Saturn is the presence of thunder and lightning. The planet likely has a small rocky and metallic core. In 1610 Galileo first observed Saturn’s rings with his telescope, but he thought they might be two large moons, one on either side of the planet. In 1659, the Dutch astronomer Christian Huygens realized that the features were rings. Saturn’s rings circle the planet’s equator and appear tilted because Saturn itself is tilted about 27 degrees. The rings do not touch the planet. The Voyager 1 and 2 spacecraft in 1980 and 1981 sent back detailed pictures of Saturn, its rings, and some of its moons. Saturn’s rings are made of particles of water and ice, with some dust and rocks. There are several gaps in the rings that scientists think have originated because 1) the material was cleared out by the gravitational pull within the rings or, 2) by the gravitational forces of Saturn and of moons outside the rings. The rings were likely formed by the breakup of one of Saturn’s moons or from material that never accreted into the planet when Saturn originally formed. Most of Saturn’s moons are very small and only seven are large enough for gravity to have made them spherical. Only Titan is larger than Earth’s Moon at about 1.5 times its size. Titan is even larger than the planet Mercury. Scientists are interested in Titan because its atmosphere is similar to what Earth’s was like before life developed. Nitrogen is dominant and methane is the second most abundant gas. Titan may have a layer of liquid water and ammonia under a layer of surface ice. Lakes of liquid methane (CH4) and ethane (C2H6) are found on Titan’s surface. Although conditions are similar enough to those of early Earth for scientists to speculate that extremely primitive life may exist on Titan, the extreme cold and lack of carbon dioxide make it unlikely. Uranus (YOOR-uh-nuhs) is named for the Greek god of the sky. From Earth, Uranus is so faint that it was unnoticed by ancient observers. William Herschel first discovered the planet in 1781. Although Uranus is very large, it is extremely far away, about 2.8 billion km (1.8 billion mi) from the Sun. Light from the Sun takes about 2 hours and 40 minutes to reach Uranus and the planet orbits the Sun once about every 84 Earth years. Uranus has a mass about 14 times the mass of Earth, but it is much less dense than Earth. Gravity at the surface of Uranus is weaker than on Earth’s surface so if you were at the top of the clouds on Uranus, you would weigh about 10% less than what you weigh on Earth. Like Jupiter and Saturn, Uranus is composed mainly of hydrogen and helium, with an outer gas layer that gives way to liquid on the inside. Uranus has a higher percentage of icy materials, such as water, ammonia (NH3), and methane (CH4), than Jupiter and Saturn. When sunlight reflects off Uranus, clouds of methane filter out red light, giving the planet a blue-green color. There are bands of clouds in the atmosphere of Uranus, but they are hard to see in normal light, so the planet looks like a plain blue ball. Most of the planets in the solar system rotate on their axes in the same direction that they move around the Sun. Uranus, though, is tilted on its side so its axis is almost parallel to its orbit. In other words, it rotates like a top that was turned so that it was spinning parallel to the floor. Scientists think that Uranus was probably knocked over by a collision with another planet-sized object billions of years ago. Uranus has a faint system of rings. The rings circle the planet’s equator, but because Uranus is tilted on its side, the rings are almost perpendicular to the planet’s orbit. Uranus has 27 known moons and all but a few of them are named for characters from the plays of William Shakespeare. The five biggest moons are Miranda, Ariel, Umbriel, Titania, and Oberon. Neptune is the only major planet that can’t be seen from Earth without a telescope. Scientists predicted the existence of Neptune before it was discovered because Uranus did not always appear exactly where it should appear. They knew that the gravitational pull of another planet beyond Uranus must be affecting Uranus’ orbit. Neptune was discovered in 1846, in the position that had been predicted, and it was named Neptune for the Roman god of the sea because of its bluish color. In many respects, Neptune is similar to Uranus. Neptune has slightly more mass than Uranus, but it is slightly smaller in size. Neptune is much farther from the Sun at nearly 4.5 billion km (2.8 billion mi) than Uranus. The planet’s slow orbit means that it takes 165 Earth years to go once around the Sun. Neptune’s blue color is mostly because of frozen methane (CH4). When Voyager 2 visited Neptune in 1986, there was a large dark-blue spot that scientists named the Great Dark Spot, south of the equator. When the Hubble Space Telescope took pictures of Neptune in 1994, the Great Dark Spot had disappeared but another dark spot had appeared north of the equator. Astronomers think that both of these spots represent gaps in the methane clouds on Neptune. The changing appearance of Neptune is caused by its turbulent atmosphere. The winds on Neptune are stronger than on any other planet in the solar system, reaching speeds of 1,100 km/h (700 mi/h), close to the speed of sound. This extreme weather surprised astronomers, since the planet receives little energy from the Sun to power weather systems. Neptune is also one of the coldest places in the solar system. Temperatures at the top of the clouds are about -218 degrees C (-360 degrees F). Neptune has faint rings of ice and dust that may change or disappear in fairly short time frames. Neptune has 13 known moons. Triton is the only one of them that has enough mass to be spherical in shape. Triton orbits in the direction opposite to the orbit of Neptune. Scientists think Triton did not form around Neptune, but instead was captured by Neptune’s gravity as it passed by. When the solar system formed, most of the matter ended up in the Sun. Material spinning in a disk around the Sun clumped together into larger and larger pieces to form the eight planets. But some of the smaller pieces of matter never joined one of these larger bodies and are still out there in space. Asteroids are very small, rocky bodies that orbit the Sun. "Asteroid" means "star-like," and in a telescope, asteroids look like points of light, just like stars. Asteroids are irregularly shaped because they do not have enough gravity to become round. They are also too small to maintain an atmosphere and without internal heat they are not geologically active. Collisions with other bodies may break up the asteroid or create craters on its surface. Asteroid impacts have had dramatic impacts on the shaping of the planets, including Earth. Early impacts caused the planets to grow as they cleared their portions of space. An impact with an asteroid about the size of Mars caused fragments of Earth to fly into space and ultimately create the Moon. Asteroid impacts are linked to mass extinctions throughout Earth history. Hundreds of thousands of asteroids have been discovered in our solar system. They are still being discovered at a rate of about 5,000 new asteroids per month. The majority of the asteroids are found in between the orbits of Mars and Jupiter, in a region called the asteroid belt. Although there are many thousands of asteroids in the asteroid belt, their total mass adds up to only about 4% of Earth’s moon. Scientists think that the bodies in the asteroid belt formed during the formation of the solar system. The asteroids might have come together to make a single planet, but they were pulled apart by the intense gravity of Jupiter. More than 4,500 asteroids cross Earth’s orbit; they are near-Earth asteroids. Between 500 and 1,000 of these are over 1 km in diameter. Any object whose orbit crosses Earth’s can collide with Earth and many asteroids do. On average, each year a rock about 5–10 m in diameter hits Earth. Since past asteroid impacts have been implicated in mass extinctions, astronomers are always on the lookout for new asteroids, and follow the known near-Earth asteroids closely, so they can predict a possible collision as early as possible. Scientists are interested in asteroids because they are representatives of the earliest solar system. Eventually asteroids could be mined for rare minerals or for construction projects in space. A few missions have studied asteroids directly. NASA’s DAWN mission orbited asteroid Vesta from July 2011 to September 2012 and is on its way to meet dwarf planet Ceres in 2015. Thousands of objects, including comets and asteroids, are zooming around our solar system; some could be on a collision course with Earth. A meteor is a streak of light across the sky. People call them shooting stars but they are actually small pieces of matter burning up as they enter Earth’s atmosphere from space. Meteors are called meteoroids before they reach Earth’s atmosphere. Meteoroids are smaller than asteroids and range from the size of boulders down to the size of tiny sand grains. Still smaller objects are called interplanetary dust. When Earth passes through a cluster of meteoroids, there is a meteor shower. These clusters are often remnants left behind by comet tails. Although most meteors burn up in the atmosphere, larger meteoroids may strike the Earth’s surface to create a meteorite. Meteorites are valuable to scientists because they provide clues about our solar system. Many meteorites are from asteroids that formed when the solar system formed. A few meteorites are made of rocky material that is thought to have come from Mars when an asteroid impact shot material off the Martian surface and into space. Comets are small, icy objects that have very elliptical orbits around the Sun. Their orbits carry them from the outer solar system to the inner solar system, close to the Sun. Early in Earth’s history, comets may have brought water and other substances to Earth during collisions. Comet tails form the outer layers of ice melt and evaporate as the comet flies close to the Sun. The ice from the comet vaporizes and forms a glowing coma, which reflects light from the Sun. Radiation and particles streaming from the Sun push this gas and dust into a long tail that always points away from the Sun. Comets appear for only a short time when they are near the Sun, then seem to disappear again as they move back to the outer solar system. The time between one appearance of a comet and the next is called the comet’s period. Halley’s comet, with a period of 75 years, will next be seen in 2061. The first mention of the comet in historical records may go back as much as two millennia. Short-period comets, with periods of about 200 years or less, come from a region beyond the orbit of Neptune. The Kuiper belt (pronounced “KI-per”) contains not only comets, but asteroids, and at least two dwarf planets. Comets with periods as long as thousands or even millions of years come from a very distant region of the solar system called the Oort cloud, about 50,000–100,000 AU from the Sun (50,000–100,000 times the distance from the Sun to Earth). The dwarf planets of our solar system are exciting proof of how much we are learning about our solar system. With the discovery of many new objects in our solar system, in 2006, astronomers refined the definition of a planet. Their subsequent reclassification of Pluto to the new category dwarf planet stirred up a great deal of controversy. How the classification of Pluto has evolved is an interesting story in science. The question is: What is and is not a planet? From the time it was discovered in 1930 until the early 2000s Pluto was considered the ninth planet. When astronomers first located Pluto, the telescopes were not as good so Pluto and its moon, Charon, were seen as one much larger object. With better telescopes, astronomers realized that Pluto was much smaller than they had thought. Better technology also allowed astronomers to discover many smaller objects like Pluto that orbit the Sun. One of them, Eris, discovered in 2005, is even larger than Pluto. Even when it was considered a planet, Pluto was an oddball. Unlike the other outer planets in the solar system, which are all gas giants, it is small, icy, and rocky. With a diameter of about 2,400 km, it is only about one-fifth the mass of Earth’s Moon. Pluto’s orbit is tilted relative to the other planets and is shaped like a long, narrow ellipse. Pluto’s orbit sometimes even passes inside Neptune’s orbit. In 1992 Pluto’s orbit was recognized to be part of the Kuiper belt. With more than 200 million Kuiper belt objects, Pluto has failed the test of clearing other bodies out its orbit. From what you’ve read above, do you think Pluto should be called a planet? Why are people hesitant to take away Pluto’s planetary status? In 2006, the International Astronomical Union decided that there were too many questions surrounding what could be called a planet and so refined the definition of a planet. Be big enough that its own gravity causes it to be shaped as a sphere. Be small enough that it isn’t a star itself. Have cleared the area of its orbit of smaller objects. A dwarf planet is an object that meets items the first three items in the list above, but not but not the fourth. Pluto is now called a dwarf planet, along with the objects Ceres, Makemake, and Eris. Have enough mass to be nearly spherical. Not have cleared the area around its orbit of smaller objects. A video showing why Pluto isn’t a planet any more: http://www.youtube.com/watch?v=FqX2YdnwtRc. Pluto has three moons of its own. The largest, Charon, is big enough that the Pluto-Charon system is sometimes considered to be a double dwarf planet. Two smaller moons, Nix and Hydra, were discovered in 2005. But having moons is not enough to make an object a planet. Ceres is the largest object in the asteroid belt. Before 2006, Ceres was considered the largest of the asteroids, with only about 1.3% of the mass of the Earth’s Moon. But unlike the asteroids, Ceres has enough mass that its gravity causes it to be shaped like a sphere. Like Pluto, Ceres is rocky. Is Ceres a planet? How does it match the criteria above? Ceres orbits the Sun, is round, and is not a moon. As part of the asteroid belt, its orbit is full of other smaller bodies, so Ceres fails the fourth criterion for being a planet. Makemake is the third largest and second brightest dwarf planet we have discovered so far. With a diameter estimated to be between 1,300 and 1,900 km, it is about three-quarters the size of Pluto. Makemake orbits the Sun in 310 years at a distance between 38.5 to 53 AU. It is thought to be made of methane, ethane, and nitrogen ices. Eris is the largest known dwarf planet in the solar system — about 27% more massive than Pluto. The object was not discovered until 2003 because it is about three times farther from the Sun than Pluto, and almost 100 times farther from the Sun than Earth is. For a short time Eris was considered the “tenth planet” in the solar system, but its discovery helped to prompt astronomers to better define planets and dwarf planets in 2006. Eris also has a small moon, Dysnomia that orbits it once about every 16 days. Astronomers know there may be other dwarf planets in the outer reaches of the solar system. Haumea was made a dwarf planet in 2008 and so now the total is five. Quaoar, Varuna and Orcus may be added to the list of dwarf planets in the future. We still have a lot to discover and explore.